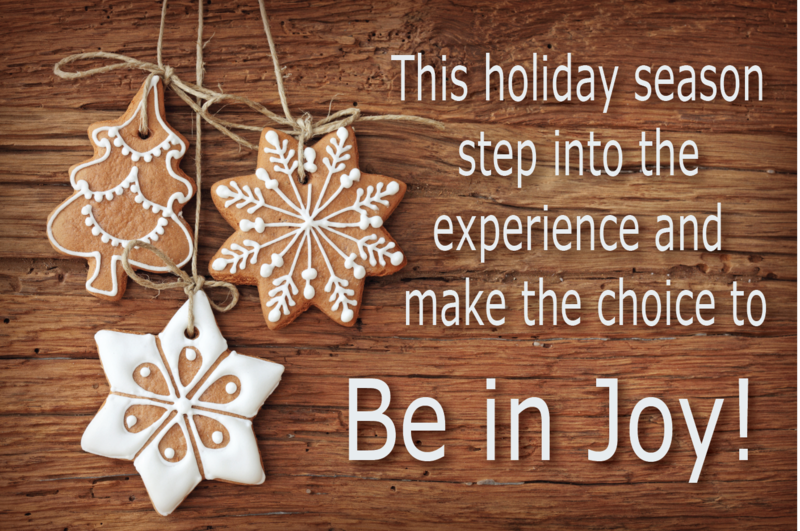 Please join Andrea, as she reflects back to her 2012 holiday season experience sharing her timeless suggestion to simply step into the moment at hand and enjoy it! This is a season to celebrate love and compassion for all. It’s the time we pause to notice the simple joys of connecting with one another. Isn’t it? Everywhere I go, people say “It’s such a busy time.” But why are we busy to the point of being stressed out? I think it’s because our lives have no room for error – (consider the impact of a head cold or a flat tire) – and then the “holidays” come along, with gatherings to attend, gifts to prepare and greetings to write, and we’re over the top. I don’t have any answers about how to make day-to-day life more manageable. (At least not today). But one thing I do know is this. It’s up to you to either enjoy this time or suffer through it. My suggestion? Enjoy. Be in joy. Today was one of those busy days for me. When at last I was free to relax on the hiking trail with my friend and two dogs, I felt just a bit of guilt, knowing how many things I had to do. But if there’s one place I can quickly focus on the moment at hand and enjoy it, it’s my desert trails. We had been walking for some time, letting the dogs choose the path. Suddenly my friend, who was ahead of me, said, “I’ll give you that hug now.” Earlier, I had sent her today’s “Note From The Universe,” which had advised me that one of the secrets to peace and joy is to give more hugs. I’ve never been one to hug a lot, so I don’t know what possessed me. The season perhaps? Before I could reach my friend, my dog Kairos jumped up, embracing her in a hug around her waist. Kairos is a hugger, though I did not know his vocabulary was this advanced. I am proud of his obedience accomplishments, but had no idea he would respond to a hug request this quickly. It was an unexpected joy. The whole thing made me pause and try to experience the moment with all my senses. The desert sunset, the chill in the air and the spirit of the season. Enjoyment. So, here’s my lesson, and one I’ll offer you. In these next days, when you make a choice to spend your time visiting, shopping, decorating or something else, do it with passion and presence. Step into the experience at hand and enjoy it. Be in joy. This post appeared originally on The Spirited Woman where Andrea is a blogger.